The Fishin' Fun Classroom Rug is a place where students can share, read or practice their ABCs by a peaceful pond. This vivid school rug is injection dyed for maximum image clarity and fade resistance. It�s constructed of durable STAINMASTER� carpet fiber that resists crushing and abrasion. The SoftFlex� backing system and serged nylon edges withstand busy classroom environments. Stain shield and antimicrobial treatments repel dirt, germs and odors, extending the carpet's life by up to 50%. The Fishin' Fun Classroom Rug is made in the USA. 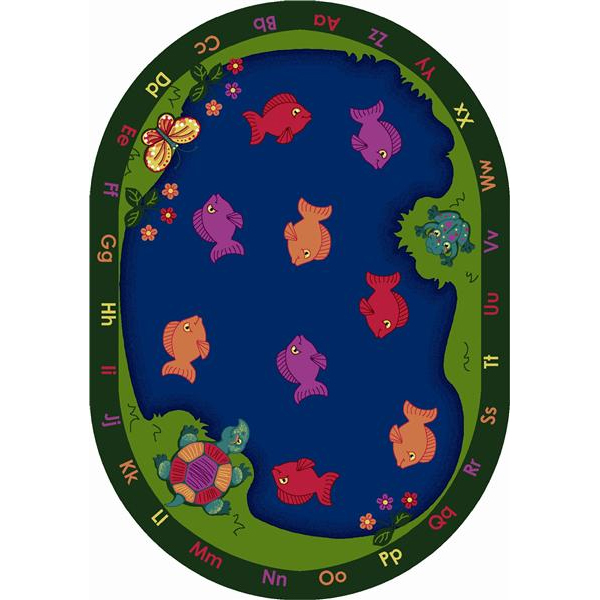 The Fishin' Fun Classroom Rug is a place where students can share, read or practice their ABCs by a peaceful pond. This vivid school rug is injection dyed for maximum image clarity and fade resistance. It’s constructed of durable STAINMASTER® carpet fiber that resists crushing and abrasion. The SoftFlex™ backing system and serged nylon edges withstand busy classroom environments. Stain shield and antimicrobial treatments repel dirt, germs and odors, extending the carpet's life by up to 50%. The Fishin' Fun Classroom Rug is made in the USA. A quiet fishing hole is a great place for reflection - so why not bring one into your classroom? The Fishin' Fun Classroom Rug is a place where students can share, read or practice their ABCs by a peaceful pond. SCHOOLSin carries the Fishin' Fun Classroom Rug in several sizes and shapes - just browse our selection below. At SCHOOLSin, we work hard to deliver the best value on school furniture and equipment to our customers. In fact, there's only one thing we do better -- great customer service. So give us a call at (877) 839-3330 if you have any questions regarding our classroom rugs. A member of our friendly customer service team will be happy to assist you.